Drum Corps International's biggest theater event of the year is less than two weeks away! 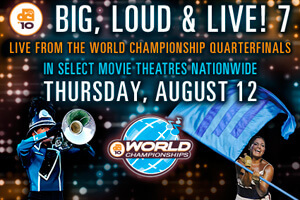 On August 12, Big, Loud & Live 7 comes to nearly 500 theaters nationwide, bringing you this year's World Championship Quarterfinals LIVE from Lucas Oil Stadium in Indianapolis! Pre-order your tickets so that you don't run the risk of your local theater selling out. Tickets are currently available through FathomEvents.com where you can search for theaters, view the Big, Loud & Live 7 movie trailer, and more! Order your tickets today and bring your friends, family, coworkers and drum corps pals to this special one-night-event on Thursday, August 12. Learn more about Big, Loud & Live 7. The 2010 edition of Big, Loud & Live is supported by the VH1 Save the Music Foundation, Inc.